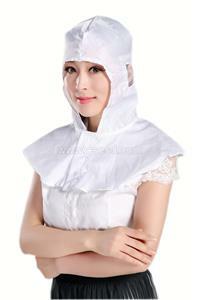 Anti-static shawl hat is composed of PFY ( polyester filament yarn ) and high-performance permanent conductive fiber through unique weaving craft, which have the lasting anti-static and dust-proof function. Product Information: Anti-static shawl hat is composed of PFY ( polyester filament yarn ) and high-performance permanent conductive fiber through unique weaving craft, which have the lasting anti-static and dust-proof function. Our company has designed and produced a wide variety of anti-static shawl hats in different style and specification, it is a necessary measure to human’s body electrostatic protection. And it is also available for customization varying with clients’ demands. Fabric Specification: 2.5mm/5mm stripe, 2.5mm/5mm anti-static conductive mesh fabric. They are all suitable in the high-clean and dust-free environment. This product is widely applicable in the 10 to10000 grades dust-free environment. Fabric Color: white, soft blue, blue, dark blue, pale yellow, yellow, pink, red, light green, green, orange, gray, black, etc.